During a scheduled 07:45 departure from Little Rock to Minneapolis, an Indicating Crew Alerting System (ICAS) message stating "R 14th duct" occurred during takeoff and the flight crew aborted the takeoff and returned to the gate. Two mechanics replaced the 14th stage bleed air-sensing loop on the right engine and tested the system. At the end of the day the aircraft was to be repositioned to Minneapolis. The RegionalJet departed Little Rock at 21:21 and started climbing to FL410. At approximately 21:52, the flight crew acknowledged to Kansas City Air Route Traffic Control Center (ARTCC) that they were at FL410. Then the stick shaker and stick pusher activated several times before the airplane entered an aerodynamic stall. Almost simultaneously, both engines shut down. The air-driven generator was automatically deployed and supplied the backup alternating current power to the airplane. At about 21:54, the flight crew asked for a lower altitude. and declared an emergency. At about 21:59 the flight crew requested an altitude of 13,000 feet. At 22:08, the flight crew stated that they had a double engine failure and that they wanted a direct route to any airport. 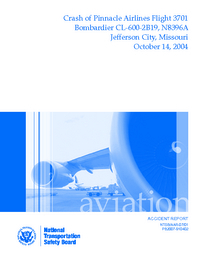 Kansas City ARTCC directed the flight to Jefferson City Airport. At about 22:13, the flight crew stated that they had the runway approach end in sight. The airplane did not make it to the airport and crashed and broke up in a residential area. about two miles from the airport. A large fire erupted. PROBABLE CAUSE: "The National Transportation Safety Board determines that the probable causes of this accident were (1) the pilots' unprofessional behavior, deviation from standard operating procedures, and poor airmanship, which resulted in an in-flight emergency from which they were unable to recover, in part because of the pilots' inadequate training; (2) the pilots' failure to prepare for an emergency landing in a timely manner, including communicating with air traffic controllers immediately after the emergency about the loss of both engines and the availability of landing sites; and (3) the pilots' failure to achieve and maintain the target airspeed in the double engine failure checklist, which caused the engine cores to stop rotating and resulted in the core lock engine condition. Contributing to this accident was 1) the engine core lock condition, which prevented at least one engine from being restarted, and 2) the airplane flight manuals that did not communicate to pilots the importance of maintaining a minimum airspeed to keep the engine cores rotating." Distance from Little Rock National Airport, AR to Minneapolis-St. Paul International Airport, MN as the crow flies is 1125 km (703 miles).